Are you looking for examples of big houses for your inspiration? Here are 20 beautiful big house ideas proving that size matters. Updated for 2019. Big houses are fantastic because they mean luxury more often than not. They can imply a summer getaway or a cozy family farmhouse. In any case, anyone would love to own one, and everyone likes to browse stunning pictures of impressive houses. So here are 20 dreamy big house pictures that will serve you as great inspiration. And it doesn’t matter if you’re looking to rent or buy one, you will enjoy them in any case. Check out these top picks and let us know which are your favorites! This is a classic Victorian style big house with a simple but charming landscape. The residence is located in DC Metro, and it’s designed by Jones & Boer Architects. An impressive beach style house with a pool. 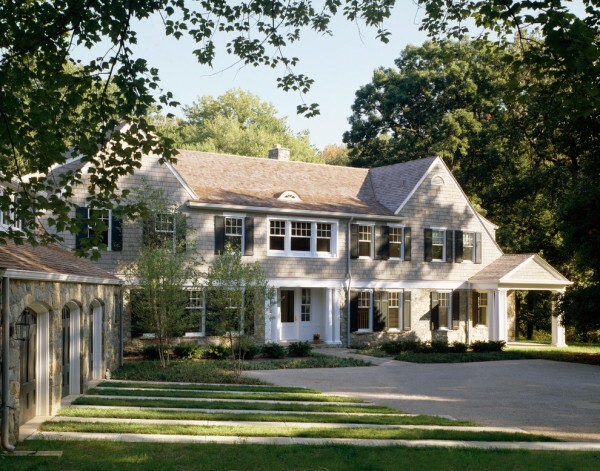 This residence is located in the New York area, and it’s designed by Merric Construction. This is an impressive renovation of a house that has kept all the original Victorian charm. It’s located in Rhode Island, and it was renovated by Clifford M. Renshaw Architects. We can see some barn style elements in this big house design. The shingle-style Victorian residence oozes class. It’s located in the New York area, and it was designed by D2A Architecture and Design. This Mediterranean big house in Los Angeles seems out of place but in a good way. You would expect this marvel to be on the shores of the Mediterranean sea. It’s stunning! One of the most attractive big houses you can make is to have the Spanish-tiled pool house designed so luxurious that people don’t immediately notice the main house. This triple threat sees a nine-bedroom complex sitting on a hillside overlooking a glimmering pool which has a putting green laid out before it. Build the ideal Italian home by facing it with light-colored stone archways. Spread a huge drive out front with inlaid red tile work. If you build it facing east, you can have the sunset behind it at no extra cost. Any number of big houses would love to see their beauty reflected in the dreamy waters of a large pond. Separate house and pool with a lush green lawn and sink a mini-tower in the middle; the in-laws need somewhere to stay. If your house has both a West Wing and an East Wing, yet you don’t have to make any world-shaking decisions, consider yourself the winner. Surround the estate with a manicured green lawn, palm trees, glossy white tiles and a fountain you could high-dive into, and the president will be calling asking if he can stay the night. A big house can still look like a doll house. Put a white picket fence outside ringed by wildflowers. Add a vibrant, green lawn inside the fencing and a full, welcoming porch. For that extra touch add flower balconies outside the upstairs rooms. If you objectify the 1870s, build a wooden two-story house and paint it white. Border the lower part and steps with red brick, along with a chimney, and run a white picket fence around the side. Stepping from the green lawn through the front door will be like stepping back in time. A white two-story house with pillars supporting an archway out front is a good start for that seaside look. Give a corner room a turreted top, and add a stone chimney. Complete the look with lanterns out front and all you’ll be missing is the foghorn. A mind-bending effect for a big house is to take a white, two-story columned southern mansion and place teak steps in front of it leading to a tropical swimming pool. Be sure to build a lengthwise deck on the second floor. The only thing better than a red brick chimney atop a two-story white house is two red brick chimneys. The second floor should be dominated by a colossal glass-door office leading onto a terrace. Another Victorian style big house in a serene landscape. It’s only made better by the stream bank paved in large stones and a lovely narrow rustic bridge leading across to the house. If you always wanted to live in a bookstore on an Ivy League campus, build a vast three-story white house. However, the front entrance should be tiny and guarded by a single brown wooden door with light-brown wooden steps leading up to the gate. A sprawling brown three-story house with white trim and a columned entrance should be stuffed among towering trees and fronted by a green lawn. The effect upon the house when the leaves change color in the fall will be spectacular, and in the summer the leaves will provide shade. With the proper landscaping and backdrop, you can take a rambling, squat three-story house and make it look as though one of New Mexico’s infamous cliff dwellings had been moved onto a lot just for you. A wooden, beige, two-story house with overlooking attics and salmon-colored tiles will stand out among a serene setting of scrub pine and palm trees. Make the trim white with a bold columned entrance.